Paragon Pax wrote: *Eyes his surroundings warily* ...be careful, there are Idiotbots around. There are? Oh crap where? hello, i would like to join 10 minutes from hell, im currently in a safe hose with a few members and im having a good time there! im not sure how to post my charecter but i am playing as pyroskull69. im newish but i know quite a bit already and have quite a few skills, would be much appreciated if i could join. hopefully you've read the stickies and understand 10 mfh's perspective and member obligations. We operate a prospective member program here, and i have entered you into it. You should find you have access to some more areas of the site, join in, post and have fun. Feel free to ask as many questions as you like. I recently arrived in Molebank and have seen a few of your members around, most recently swaying at a revive point, and thought I'd pop in and say hi. I've been thinking of joining a group but dislike the "trenchie" aspect of most survivor groups. If you'll have me, I'd be willing to stick around Molebank for a while. I promise to search for needles and monitor your revive point between Football Manager matches (I'm hopelessly addicted). My UDID is the same as my forum name. (Tried to link it, denied). hey dude. an admin will be along soon. Nice to have a new face in Molebank! seen your tags and heard a lot of talk about you. my safehouse is Felix General Hospital, although sometimes i run out of AP and have to stay at a building under attack. do you have an established Radio Frequency? Hey, Wilson. Go ahead and start an account here with your character name. That way we can keep track of who you are better. Then we will give that account access to the potential member area of our forums. Glad to hear of your interest! I have added you to the potential mebers section, thanks for stopping by. Whats you in game name, so i can add you in contacts in UD? I have been roaming around for some days now. I did not want to join a group in an external site so as not to spoil the RP element of the game, but I arrived in a VSB hospital (finaly), where I met a 10mfh member and saw a tag on the wall. So here I am. Allen Wood, clueless civilian, consumer. "You are inside St Elisabeth's Hospital, its lobby covered with quarantine posters. The building has been very strongly barricaded." Glad to see an active group of people in this game. Yep, that was my intension. But now it is EHB and no free running for me. I 'll be around. ST Es was VSB when I left it this morning!!! Hello! I'm Chyena, a helpless revived Zombie/ level 1 Civilian who roams around the city, trying to stay alive! I was searching the stats, when I saw your group and became interested. I would like to join, so in the future I'll be able to help newbies like me to familiarise with the surroundings and avoid zombies and PKers! Thanks for stopping by. What's your UD ID ad player name, please? You can find the ID (the 6 digits) in the web address when you're in your character. Also, where are you currently on the map? ^^ Hi again! Thanks for replying so quickly! My player name is Chyena and my UDID is 2025033. At the time I'm standing at point 87;38, which is a cemetery. Oh, almost forgot, I'm a zombie now. I have to learn to not leaving my warehouse when I'm short of AP. I also forgot to say that I'm in the Spracklingbank suburb. I'll try to get to Molebank as soon as I'm revived again. Cool. Head down to St Es in Molebank, it should be VSB so you can get in. Say Hi when you're in there and we'll go from there! I'm fairly a new player (two months or so) and I currently am stationed in Molebank at St. Elisabeths Hospital. I've been hanging around here for the past few months and see quite a few people from 10MFH. Seem like a good crew and I'd like to join and help out in any way I can! Thanks. We're always looking for new team members, ratatat3. Unfortunately, you've been listed on the Zerg Liste. I suggest you follow this link: http://zombies.dementiastudios.org/boards/index.php?topic=12.0 and follow the directions to get off the list. Once that has happened, we can welcome you as a new member of 10 minutes from hell. Okay, as I said I'm fairly new and had no intention of zerging. My characters are in completely separate areas now and I will work on getting off that list so I can join. Thanks for the quick reply and info on that. 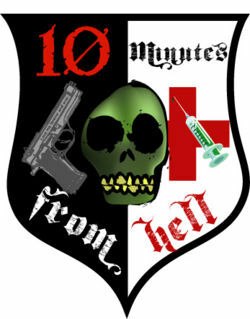 I want to join 10 minutes from hell because they were the ones who helped me and gave me shelter when I first dropped into Malton. Now that I'm trapped in Malton, they're the people I'm trying to help. I've already been through a couple of bad seiges with you guys, so I'd like to become an official member at least. Currently, I am to the west of St. Jude's Cathedral --about half a klick away to the west of St. Elizabeth's Hospital --trying to restore the Police Department to its former glory so we can get firearms circulated around the area. So I can meet up with you guys later in a few days. Good hunting. St Es is nearly back to normal. We'll set up you up in the potential members area for now. Hang out for us with a bit in 'The Mole' and we'll go from there. Thanks 'Arry. I actually fell back from the SWPD to the BWPD. SWPD is swarming with zeds and may get ransacked even further than the 4AP it was left at.